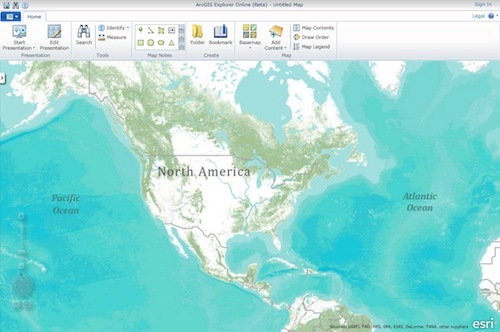 ArcGIS Explorer Online is similar in appearance to the desktop version of ArcGIS Explorer, and has some of the same capabilities, but it?s a lighter weight version that works in a browser, and is built using Microsoft Silverlight. So what we have here is a cross platform GIS analysis platform. I’ve liked what I’ve seen from ArcGIS Explorer Online and I think it is a solid start to platform agnostic client applications. It requires Silverlight to run, but I’m able to use it flawlessly on my MacBook Pro laptop. It mimics the Microsoft UI standards with the ribbon, but I’ll be frank that I’m beginning to like the ribbon interface. Of course if you hate it, you’ll probably hate the app. When you start working with the app, the first thing that will catch your eye is what ESRI has stuck in the upper left of the toolbar. If I had never seen ArcGIS Explorer Online before, I’d assume that ESRI would have put “Add Data” or “Search” or even “Basemap” in that prime spot. But as you can see to the left, Presentation gets the first place everyone looks. I’m not sure if this is by design but ESRI thinks we’ll be making lots of presentations with ArcGIS Online. I had see Bernie Szukalski use the presentation mode with great success at the ESRI Developer and Business Partner conferences so I get the power. I’d just assume presentations would be a ribbon on its own and not on the primary one. The basemap button doesn’t disappoint. 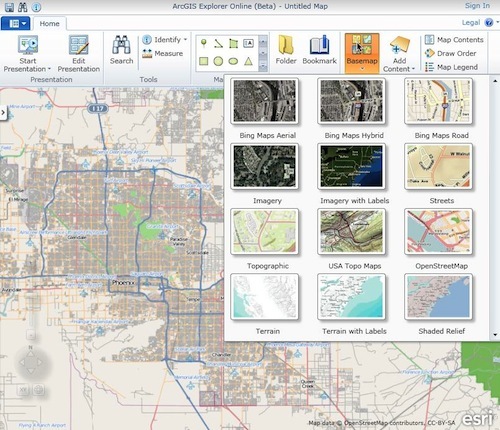 If there is one thing ESRI has gotten right over the years, it is the freely available basemaps they’ve offered up through ArcGIS Online ArcGIS.com. These are all available here including the Bing layers, ESRI’s Imagery and Streets, the wonderful ESRI Topographic map and of course now the OpenStreetMap layer. Adding content is where I think ArcGIS Explorer Online will eventually shine, but for right now it is limited to only web services that are available on ArcGIS.com or ArcGIS Server services. I’ve been told OGC support will be coming soon, but as of today you can only add ESRI web services or consume services from ArcGIS.com. As you’d expect, you can save your maps to ArcGIS.com and choose to save them privately, share with a group or share with the world. There is no ability to share a permalink as you might with Google Maps, but saving to ArcGIS.com and then sharing that URL is probably the method for now. ESRI also has provided some “Featured Maps” (I’m assuming this comes from featured maps on ArcGIS.com) that you can get started with. 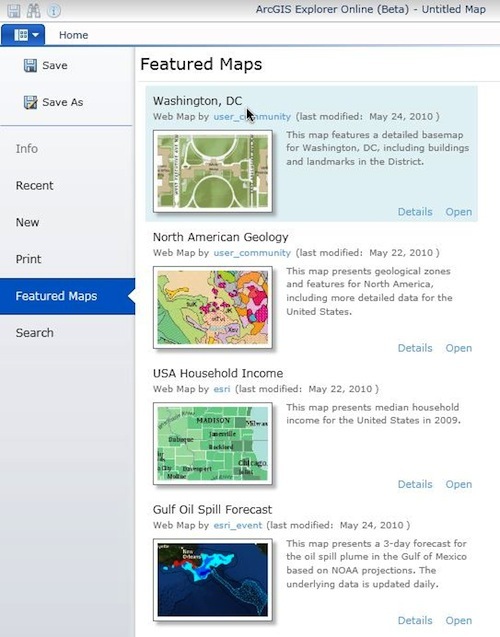 You can grab existing “Featured Maps” that ESRI provides to get started. I like the start of ArcGIS Explorer Online. Building it on Silverlight seems like a smart move as it runs flawlessly on any computer I used. The biggest limitation I see right now is the lack of OGC support (WMS, WFS, CSW and of course KML) but ESRI has told me that is coming down the road. I also would have liked to see a permalink feature to share quickly with friends maps I create, but I’m guessing ArcGIS.com is the driving force here so I might as well get used to sharing ArcGIS.com links. I’m not sure how I could share my ArcGIS Server services with ArcGIS Explorer Online (embed or link that I can put in a blog post), but hopefully that part of the story will be set by the ESRI UC.